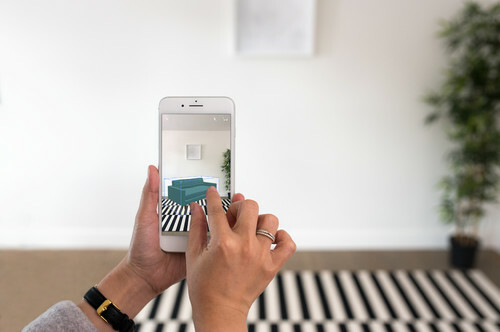 If you can’t envision how a piece of furniture or art you are considering might look in your home, a new feature in the Houzz app could help. 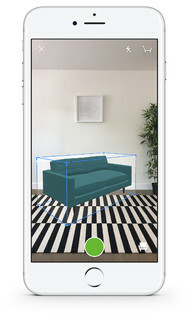 Houzz’s 3D feature for iPhone and iPad enables you to place items in your room and turn them around to any angle. 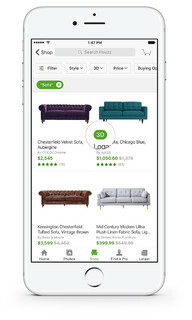 The Houzz app, updated with this new feature for iOS, is now available to download on the Apple App Store℠. 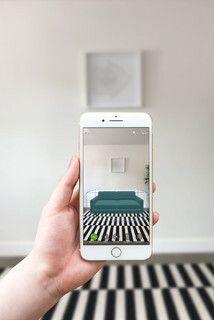 This photo shows a Houzz user capturing a shot of her room and using the “View in My Room 3D” feature to see how a sofa would look in the space. She’s able to turn the sofa around and scale it to size. She can do this for multiple products, enabling her to get a sense of how they’d work together in her room. 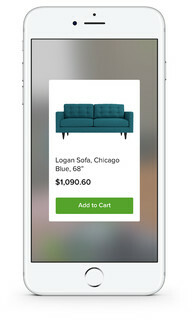 Here is a closer look at what the Houzz user sees on her iPhone screen. The blue box around the piece of furniture tells her the dimensions of the product. 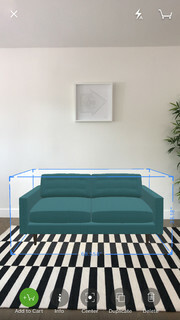 With the 3D feature, the Houzz user can turn the sofa around to see it from various angles. The 3D models have realistic textures, so you can see how the surfaces would look in your home. This feature, which was shaped with feedback from Houzz users during early testing, is available for over 300,000 products sold on Houzz, with more to come. There are two ways to find these 3D-enabled products. 1. Use the 3D filter in Shop. One option is to use a filter in the Shop section that allows you to browse for 3D products only. Go to the Shop, choose the product category, then the subcategory, and then tap the filter button on the top left corner of the screen. Select 3D and choose the product you want to see in your room. 2. Look for the green 3D badge. Alternatively, you can look for the 3D badge attached to products as you shop. Here, the green badge beneath the teal upholstered sofa indicates that it is 3D-enabled. Select the product you want to see in your room. Once you’ve selected a product, you can tap on “View in My Room 3D,” which will launch your device’s camera. From there, hold your phone upright and point toward the part of the room where you want to place the product. 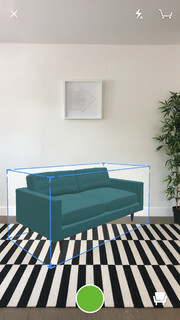 A clear box with blue edges will appear in the app as the 3D object loads. Tap the selected product and its dimensions will appear. Pinch with two fingers to make the product appear larger or smaller in the room. Tip: To scale the product for your room, use a measuring tape or other marker to show the dimensions of the actual piece on your floor. This marking will show up on your screen and you can use it to size the product. You can manipulate the product, rotating and placing it at the best position and angle to see how it would look in your home. To see how it looks with another product, simply tap the product button to add more selections to your room. 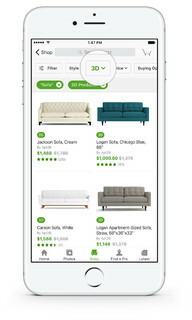 You can also use this feature in the Houzz app to buy the product. Alternatively, you can capture what’s on your screen and save the image to a Houzz ideabook. The feature is now available for iPhone and iPad, and an Android version is in the works. To use it, you need iOS 10.0 or higher, iPhone 5s or later, iPad Air and later, and iPad mini 2 or later.